In the tunnels beneath the X-Factor headquarters, Scott and Jean clean-up the radiation left behind by Bulk and Glow Worm and discuss Scott's marriage to Madelyne. Upstairs, the rest of X-Factor watches news coverage of the "battle" between X-Factor and the X-Terminators. As Rusty prepares for a training session, he worries that someone might recognize him from the footage of him fighting alongside X-Factor. 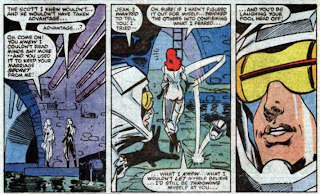 Meanwhile, Freedom Force is tasked with bringing Rusty to justice, and sure enough, Spider-Woman recognizes him from the footage. 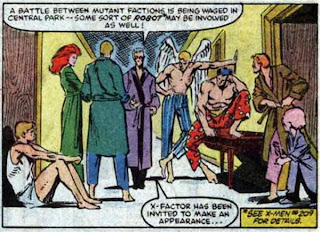 Later that night, X-Factor is awakened by Hodge, who has received reports of mutant factions battling a robot in Central Park. In part to help their public image, they decide to investigate as X-Factor instead of the X-Terminators. Rusty is eager to join them, but is angrily told to stay behind by Scott, who has just misunderstood a conversation between Warren and Jean. 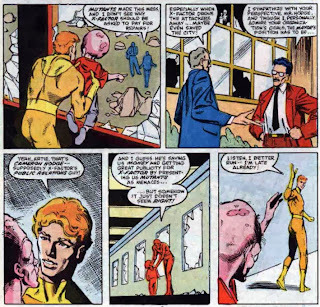 However, Artie detects Freedom Force following X-Factor, and when Hodge refuses to listen to Rusty's concerns, he sets off on his own to help them. X-Factor arrives at Central Park and heads in the direction of an explosion in the Sheep Meadow. Just then, Rusty catches up to them, but the group is intercepted by Freedom Force, who declare they have a warrant for Rusty's arrest. A fight breaks out between X-Factor and Freedom Force, during which Rusty is able to slip away with the help of the Morlock girl, Skids. However, their escape draws the attention of an angry mob. The invincible Skids tries to hold them off while Rusty runs away, but he's can't let Skids face the mob alone, and goes back for her. As the mob closes in, Freedom Force catches up to Rusty and prepares to take him into custody. 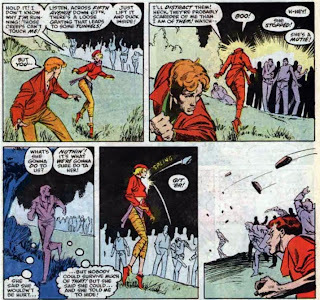 Marc Silvestri, future X-Men and Wolverine artist and Image co-founder, fills in on pencils, making this his first work within the X-Men franchise. Joe Rubinstein remains as the inker, so the end result doesn't look too dissimilar from the previous issues, with Silvestri's style only occasionally poking through. 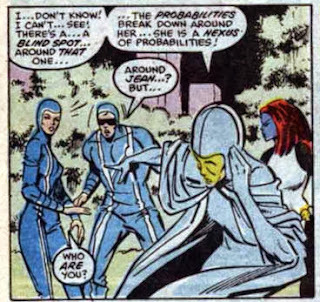 Jean learns in this issue that Scott is not only married, but has a baby (who still goes unnamed). She mentions that she always thought they'd have a girl together, which is possibly a reference to Rachel. Rusty meets Skids for the first time, kicking off a relationship that will result in the pair being referred to together as a couple far more often than they are referred to individually. 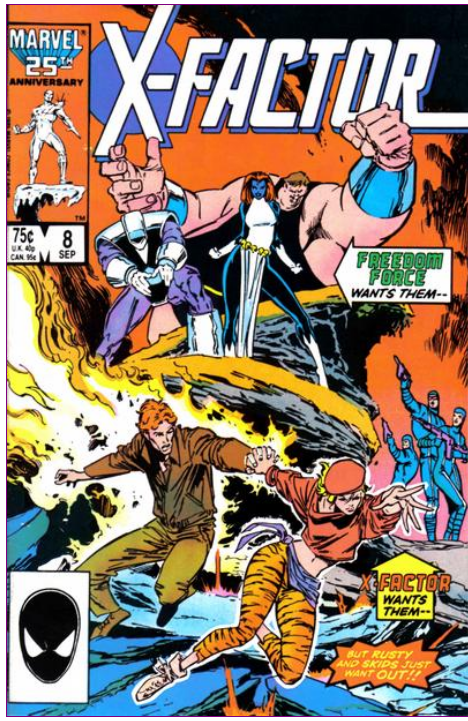 This issue also kicks off a "Freedom Force tries to arrest Rusty" storyline that will run for some time and eventually get migrated over to Simonson's New Mutants run. We get more possible hints in this issue that Hodge's motives are less than pure. Destiny notes that the future around X-Factor is hard to see, for some reason, then upon encountering Jean (not realizing who she really is), freaks out that a nexus of probablities surrounds her. This is likely another feint at the whole "is Jean Phoenix?" subplot setup in issue #6, but it largely goes nowhere. Cyclops is able to blast away a molecule-level thickness from the tunnels beneath X-Factor HQ. It is confirmed in this issue that the media is referring to X-Factor's costumed identities as "the X-Terminators". Avalanche is wearing a new helmet in this issue (seen on the cover). X-Factor is called in to investigate reports of a group of mutants fighting a robot in Central Park, a reference to issues #208 and #209 of X-Men, though as was noted in the comments on the post for issue #208, Nimrod detected the presence of X-Factor when he arrived in the park in issue #208, even though here, X-Factor doesn't arrive in the park until after Nimrod has begun battling the X-Men and Hellfire Club. Similarly, Spiral is seen departing Freedom Force's confrontation with X-Factor in order to lure Rachel into her Body Shoppe, though the timing of that fits better, as Spiral doesn't show up before Rachel until after Nimrod's attack. Jean (rightly) tells Scott that the Scott she knew never would have treated either her or Madelyne the way he has. Jean admits that she doesn't blame Scott for moving on and marrying Madelyne when he thought Jean was dead, saying it's what she would have wanted (echoing Scott's similar sentiments from X-Men #175). Warren acknowledges both the oddness of his returned attraction to Jean as well as the fact that he already has a girlfriend, even while Rusty continues to moon over Jean. But then, Rusty is quickly captivated by Skids upon meeting her. Scott comes across Warren trying to comfort Jean, assumes the worst, then gets all upset about it, like he has any grounds to stand between Warren and Jean at this point. As Rusty and Skids flee through Central Park, an anti-mutant mob forms up in their wake, complete with brick-throwing. This issue is notable for bringing X-Factor, comprised of the original X-Men, into conflict with Freedom Force, formerly the Brotherhood of Evil Mutants (specifically, Angel and Cyclops have the most history with this incarnation of the team, but they've all fought Blob before), signifying the book's closer association with the larger X-universe begun with the arrival of Louise Simonson. It's also the title's first unofficial crossover with X-Men (though, as has been noted, the timing isn't perfect - Simonson and Claremont are likely still working out the kinks in this process), a behind-the-scenes crossover that will be mimicked, on a larger scale, during the upcoming "Mutant Massacre". 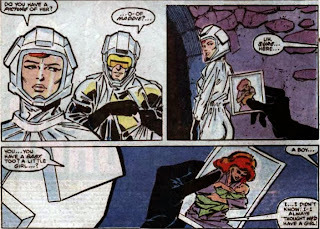 Beyond that, Simonson continues to air the book's dirty laundry and ramp up the soap opera, as Jean learns about Cyclops (still unnamed) baby and admonishes him for his recent behavior (likely echoing readers' sentiments), Angel remembers he's dating Candy Southern, and Rusty pines for Jean right up to the moment he meets Skids. In the process, Simonson is starting to craft an identity for the book. At a time when Claremont is playing with the conventions of the superhero narrative in X-Men (and on the verge of shaking up the title more than ever) while writing New Mutants as a looser, more episodic and character driven book, X-Factor is slowly becoming a more relationship-based, adult-orientated soap opera (albeit while still within the framework of a superhero action-adventure story). "Soap Opera" may not be your preferred adjective for a book's style (personally, I like it, especially given the history amongst these characters), but the fact that Simonson is giving the book any identity at all is preferable to what had come before. The X-Men hunt for their missing teammates in Uncanny X-Men #210, the New Mutants make a new friend in New Mutants #45 and the Freedom Force/X-Factor fight continues in X-Factor #9. I feel the term "overpowering inker" gets tossed around a lot, but you don't really know it's meaning until you see an issue like this. I would never have guessed these pencils were by Silvestri if you hadn't said so. All I see in the faces and shadowing is Rubenstein. Anyway -- I've never read most of the original X-Factor run aside from the big crossovers, as I've noted before, which is especially odd because once Simonson takes over, it sounds like it's right up my alley. Not being a huge fan of the direction Chris Claremont was taking the X-Men at this time (I like the post "Mutant Massacre" execution, just not so much the cast), the more traditional superhero stuff with more of a classic cast as seen here is just the sort of thing I'd go for. I really need to check it all out someday. "Avalanche is wearing a new helmet in this issue (seen on the cover)." I hate this helmet. Talk about an unnecessarily ugly change. His old look was distinctive. Now he looks like he's dressed up as ROM. But didn't John Romita Jr. originate this helmet over in Uncanny? I always thought it showed up there first. @Matt: But didn't John Romita Jr. originate this helmet over in Uncanny? I always thought it showed up there first. You're absolutely right: he had it in Uncanny #206; I just completely glossed over it there. Probably because it's on the cover of this issue. Good catch. Also, totally agree that it's a dumb and unnecessary change.
" I would never have guessed these pencils were by Silvestri if you hadn't said so. All I see in the faces and shadowing is Rubenstein." Jason -- I actually like Rubenstein quite a bit, especially on Dave Cockrum -- but here, to me at least, he seems to be doing a lot more "finishing" than on other jobs. Rubenstein over Cockrum or Byrne still look like Cockrum and Byrne to me, but this just doesn't look like Silvestri to my eye. However, I'm not all that familiar with Silvestri's style prior to becoming the regular penciler on Uncanny X-Men, so if you say this is what his work typically looked like at the time, I'll gladly believe you. When is there not "a temporal-spatial anomaly" messing up Destiny's powers? Just how Marvel is that? Notwithstanding that the series isn't anything special, even if it's definitely improved, you can pretty much boil down what made Marvel Marvel to "consequences" and "personal issues". Rusty's heart is in the right place, except for that part that's wandered down south, but it's really immature (to be charitable, laying the blame on the character rather than how he's written) for him to go from worried that people will find him and even more worried that he'll never be able to have a relationship to following X-Factor out into the field because it's the right thing to do and wanting to be protective of Jean and then Skids. I guess being chivalrous or just wanting to help fight battles that concern him could be a sign of maturity, but real maturity would be recognizing that since he doesn't have enough control over his powers yet he's only endangering himself and others including the people helping him. The relationship stuff would be totally Marvel too if it weren't quite so weird. Vera popping up isn't the strangest thing, especially since X-Factor is a revival of the original X-Men, but I feel like everybody reverted back to referring to her as Hank's girlfriend when if memory serves she was out of the picture for a while — he was certainly surprised to see her New Wave punk Valley Girl look. If we got scenes of them falling into familiar patterns, that would be one thing, but we don't see any moment where a spark is rekindled. It's just "They're back in touch and Vera's official role is Hank's Girlfriend." Making it even odder is the fact that Candy Southern hasn't moved out to NYC or even really been spoken of until this issue (which of course would've made the dialogue and thought balloons of Warren's in which his feelings for Jean apparently resurface even more awkward). Scott has him beat at Husband of the Year, but he and Candy were/are still basically married. I'm glad this is another one of the plot contrivances that Louise Simonson has picked up on. There are scattered places in which the faces look like the work of Don Newton to me, which is jarring. Rubinstein only inked Newton a handful of times, so it's not like when I picture Newton's work I'm really thinking of Newton/Rubinstein; I don't recall ever finding Silvestri's work as reminiscent of Newton's, either.